Here is Baby O in his Valentines Day shirt! Isn't this the cutest little frog you've ever seen? It is hard to find cute little boy Valentines designs, so I knew this one was one I had to have! It is from Five Star Fonts. I think it will be cute even after Valentines Day! 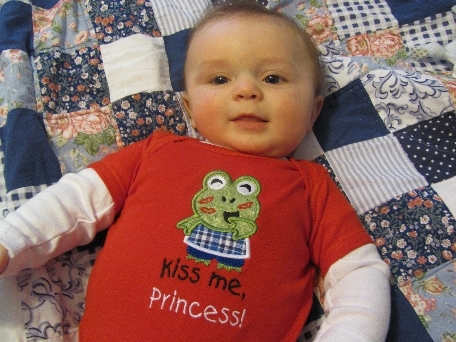 It is an applique design & is available in red, short-sleeved onesies & T-shirts. (Owen has a long sleeved shirt under his!) Onesies available in sizes 6 mo & 12 months. T-shirts available in sizes Youth Sm-Lg. Also availabe on a white bib with "Princess" done in red.